Today’s copyright law is ridiculous and offensive, to say the least, and this week it’s Mr Roger’s Neighborhood” turn to prove it. 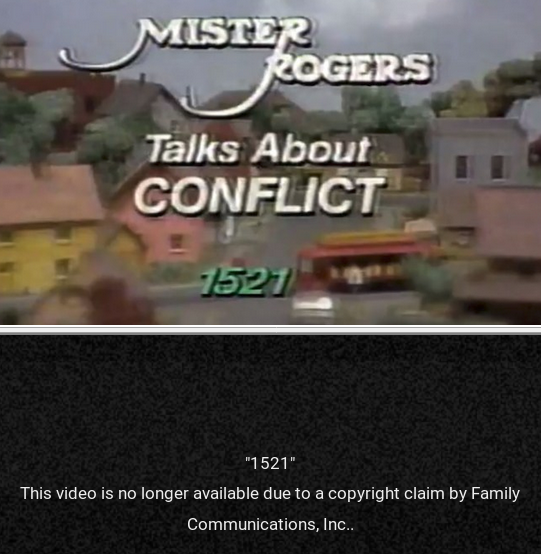 "Over the weekend, two episodes of Mister Roger's Neighborhood "Conflict" series unexpectedly appeared on YouTube after being unavailable for three decades. YouTube quickly removed them, but to many, the timing felt related to Trump's plans to defund PBS." but after ONE DAY became lost again, “just because”. That is, just because current copyright law allows somebody to deny everybody else something that they had published, on the sole basis of copyright. This is indecent. In an era when digitizing information and distributing it, is very cheap, situations like “out of print”, or “not in stock” should not exist at all. Not for published creative works like these, at least. The fact that it is legal to say “I published this, but since I don’t want to do it anymore, nobody else should do it period”, is NOT good. As a minimum, it’s a cultural loss. In some cases, it’s a wonderful legal mask for censorship.